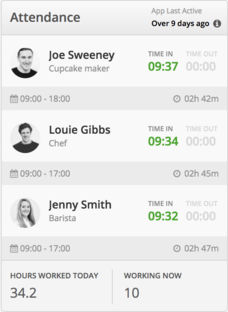 What is the Attendance Widget and how does it work? The Attendance Widget is located on your main Dashboard when you login to Bizimply. What shift they are on today. How long they have been clocked in for and if someone has forgotten to clock out. If an employee has forgotten to clock out for a shift there will be a red button beside their name showing the number of hours they have been clocked in for. Please note if your app is showing as last active over 16 hours ago, this may mean that your Timestation is offline. Please check that your iPad is connected to a strong Wifi connection. Find their name on the Attendance widget > Click on the red button showing their hours. This will then bring you to their Review Punch Times page and to the day on which they forgot to clock out. N.B. If there is a lock symbol in place of where the delete button is this means that you need to, unapprove that employees timecard for that week and then this will allow you to delete the record. Once the record has been deleted you can approve the timecard again for that week. You will now notice that the employee has disappeared from the Attendance Widget as still being clocked in for their shift.